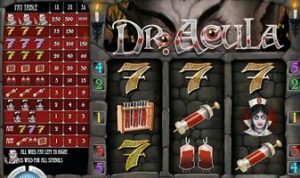 Dr. Acula Online Slot, Rival’s new Halloween slots for 2018. This month we’ve seen a handful of new online slots for Halloween. Microgaming‘s imaginative partners at Triple Edge Studios brought us Wicked Tales: Dark Red. The genius creators at Yggdrasil delivered a fantastic fright in the new Wolf Hunter Slot. 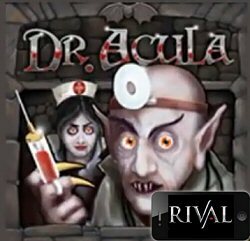 Today, fans of the horror genre are invited to play the cleverly-titled new Dr. Acula Slot from Rival. How does it stack up to the competition? We’ll find out in today’s review of Dr. Acula. This new creepy reel crawler is a classic 3 reel game with spine-tingling graphics. Its main character is Dr. Acula, ostensibly designed to mimic the vampire from the cult-classic film, Nosferatu (1922). He is the highest paying symbol in the game, worth up to 1,000 coins. Dr. Acula’s icon is also a wild symbol in the game, replacing any other symbol necessary to line up a win on any of the slot machine’s 5 pay lines, running left-to-right. In all other regards, this game meets the classic definition of a traditional 3-reel slot. There are no other special features, no bonus rounds, no multipliers to speak of. If you like classic 3 reels, the overall game play is good. And like the most popular classics of all time, it does offer a favorable paytable for multi-coin bettors. Inserting the maximum 3 coins delivers the best bang for your buck. For example, a trio of Dr. Acula symbols will pays 250 for 1 coin, and 500 for 2 coins, while inserting 3 coins pays 1,000. For maximum RTP, I would not recommend playing for anything below the max 3 coins. There is one thing I really don’t like about it, and that’s the sound effects. The background music is what you would expect—an eerie pipe organ melody perfectly suited to the theme. It could have been great on its own. Unfortunately, every time a reel stops, it comes with the grating sound of someone jamming all the organ’s keys at once. It’s the kind of sound they play in an old horror film just as the monster appears, but when this sound plays over and over, three times per spin, it truly assaults the ears. I had to turn the sounds off within the first minute of play. Another possible negative is that more than 90% of all Rival powered online casinos that accept Canadian players are licensed in Curacao. I personally do not trust the Curacao eGaming regulatory authority, and would never recommend our readers play at sites licensed there. Not all casinos of this jurisdiction are bad, but Curacao does next-to-nothing to prevent operators from going rogue, or to punish those that do. Suffice to say, if you want to play the new Dr. Acula Online Slot, be extra careful where you play! Or, skip this one and head to the safety of Royal Vegas Casino for Microgaming’s frightfully fun new Halloween slots for 2018, Wicked Tales: Dark Red.